Castiglion del Bosco, a vision of endless natural beauty and luxury in Buonconvento, Italy served as the stunning backdrop to an extravagant weekend-long Tuscan wedding. 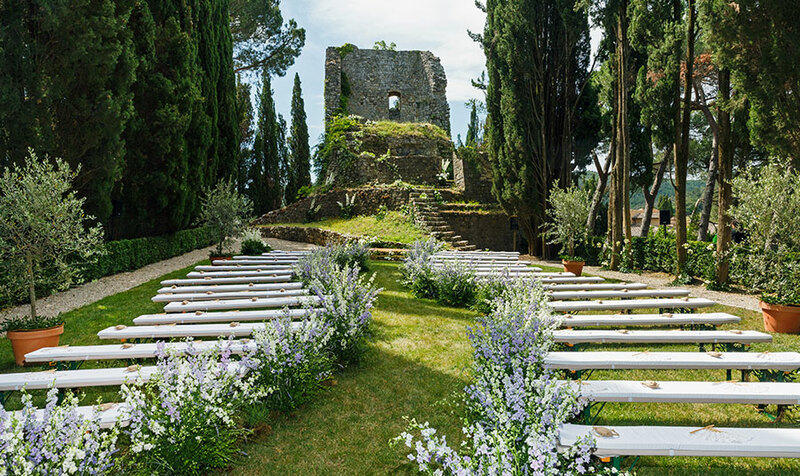 Guests ascended stone steps lined with violinists to a remote ceremony lush with wildflowers and greenery, where the bride and groom wed to the sounds of a live orchestra. An exquisite tented reception followed, with guests seated at wooden banquet tables topped with fresh local blooms and romantic lilac-colored décor.